Pastors tell us that church involvement goes up dramatically after having a GFA speaker, who challenges their congregation to live selflessly and with an eternal mindset. The Word of God will come alive as one of our passionate speakers shares with your church. This ministry will inform, challenge and stir your people concerning the vast needs in worldwide missions. I wholeheartedly recommend them to you and your congregation. [GFA World] is a leader among the ministries committed to assisting nationals in reaching their own peoples. If you have a heart for reaching the unreached, this is a ministry well worth your consideration. 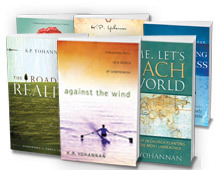 I joyfully embrace K. P. Yohannan, along with the staff of [GFA World], and purposefully endorse what our Lord is doing in and through this pivotal kingdom venture.